Over the past month, as we have finally had some periods of rain, I have been asked whether I walk in the wet weather. Yes — I enjoy walking in a mist or light rain, but I do try to plan walks so that I do not get caught in a downpour. I also like being out on a walk right after a heavy period of rain, to observe its effects on the city environment. I have not seen too much heavy flooding, though water tends to accumulate at many street corners; I have wished on more than a few occasions that I had rain boots. Growing up in the San Francisco area, I got used to hearing about the landslides that happen every year that we had heavy rains. The photos would regularly appear in the local newspapers showing a family beside their home in the Santa Cruz Mountains or up by the Russian River that had slid several feet down a hill. Despite knowing this, I was not aware until moving to Berkeley that there were concerns in the hills here as well. Up in the hills along the Hayward earthquake fault are zones where homes have slowly been shifting down the hill (sometimes even creating property line disputes) and where there is potential danger of more serious landslides. Despite the headache of dealing with the concerns that come with having a house in the potential landslide zone, it seems that many people are willing to take the risk (or would take the risk if the could afford to live there) for the chance to live somewhere where they can see the Golden Gate Bridge from their window or deck. As I have mentioned in previous posts, I map out a route for a walk before I go out, and write it on a piece of note paper to keep in my pocket. I carry a map as well, but try to avoid pulling it out to look at it on the way. In some areas of the Berkeley hills, I am finding this to be a bit of a challenge. A few times I have made the wrong turn or been unsure about which way to turn, mostly because not all intersections have street signs or even markings in the pavement. Getting really lost is not an issue — I know the major streets in the hills and landmarks can be used to figure out which way one is heading — but walking all of the streets in the hills is proving to be a much slower process than the grids of the flatter areas. Walking up the hills has not proved to be too much of a problem. There are some steep ones, but most are winding and views at the top are rewarding. 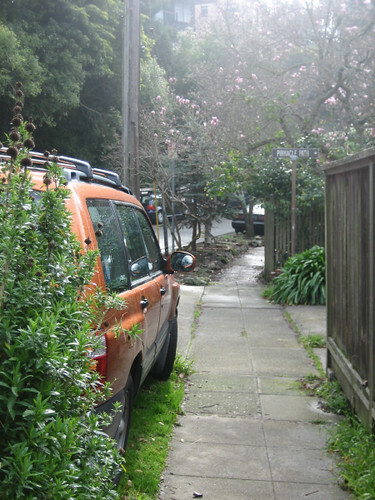 Near the beginning of this walking project, I walked Marin Avenue, which is probably one of the steepest streets in town, 25% grade in some places. I walk a few blocks of it here and there on other routes to get to other streets, but generally I avoid it. And I am always a bit nervous about crossing Marin as well — it is similar to the steep streets in San Francisco, where cars will drive up and over a bit into the crosswalk area to avoid rolling back on the slope, and the visibility isn’t always the greatest. I ran across the Berkeley Hills Death Ride (inspired by the Markleeville, CA, Death Ride over mountain passes) which is a bicycling challenge on the some of the steepest hills of Berkeley. I remember seeing a listing for this ride one year where the riders were to meet at Peets Coffee for triple or quad espressos before doing the ride. Which reminds me that I forgot to mention in my entry about coffee roasters that Peets locations all over the Bay Area seem to be favorite meeting spots for group bike rides. The Peets on Domingo Ave. in Berkeley seems to be one of the more popular locations for starting rides through the Berkeley hills. Direction confusion and hill steepness were not big surprises to me, and really have not been major issues. The most surprising challenge in walking in the hills has been residents who seem concerned to see someone walking down their street. Particularly on dead-end streets, but also on other non-major streets, I have had people stare at me from their cars or the fronts of their houses, obviously wondering what I was doing there. What I am starting to realize is that you do not get glances if you are walking down the street in a jogging outfit and headphones, or if you are walking with a dog, but someone just walking in regular clothes (and especially alone) and looking around is suspicious looking to many people. I can certainly understand the concern — burglaries do happen in Berkeley as they do everywhere else — but it is kind of a strange thing that just walking without some other obvious motivation, such as exercise or walking your dog, is a suspicious activity. Of course this doesn’t stop me, and if someone asked I would have nothing to hide, but it is an interesting observation. The contrast between the hills and the flatlands of Berkeley comes up often in historical accounts of Berkeley and in current-day conversations about Berkeley. I have talked to a number of people who own homes in the flatlands of Berkeley but hope someday to “trade up” to a house in the hills. I have also encountered some envy and even a few disparaging remarks about the “hill people.” For the most part, though, people seem to appreciate the variety offered by the different parts of town. After a number of walks in the hills, I began to notice that the Berkeley hills are somewhat different from the affluent hilly neighborhoods that I have encountered in other parts of the Bay Area and beyond. There are plenty of large homes with sweeping views of the Bay, but there are also some modest homes mixed in. The photo here (taken earlier this year — I just remembered it after a recent and surprisingly difficult search for a notary) shows a view of a small, one-story ranch house up in the hills. The other houses on the street were much larger, but this one sat amongst them appearing to be untouched by any remodeling. Another characteristic of the hills is very apparent to a walker is the lack of businesses. Most other neighborhoods have a commercial strip of some sort in the vicinity. It would definitely present a challenge to the walker or cyclist, but I have not doubt there are at least a few people who live in the hills without a car and find ways to haul their groceries up the streets and stairways. One day on a Sunday morning walk on a street bordering Tilden Park, a woman walking out of a house asked me if I knew where she might get some cigarettes around there. It appeared as though she had been at a party up there and stayed the night. I had to break the news to her that she was a long way from a corner store. One mystery solved (banana trees), two more added to the list: a strange tram and a pulley device. The trolley pictured above might seem perfectly normal in a park or in front of a historical museum. But no — this very short tram is in someone’s front yard in the Thousand Oaks neighborhood. Grocery transport system? Part of a railfan’s collection? Fun for the children? Hard to say. 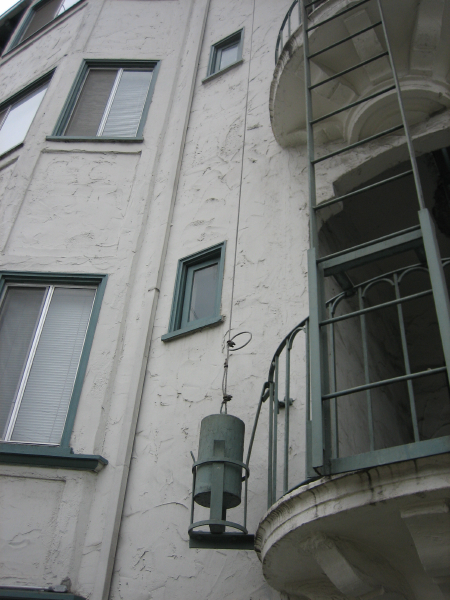 Across town, not far from University and San Pablo, is a strange weight/pulley system attached to the side of an apartment building. The weight (at least that’s what I think this is) is just hanging from the cord attached to the balcony at the next level up. I have seen all sorts of laundry lines, dumbwaiters, fire escape systems, etc., but I could not immediately see the purpose of this object. Perhaps something is missing from the system. Any clues about this device would be greatly appreciated!